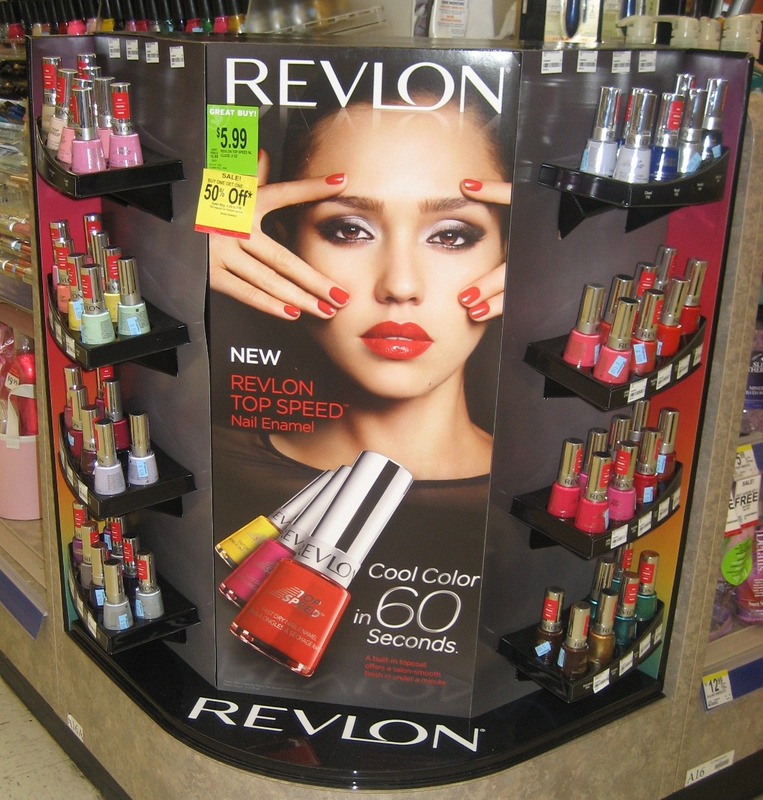 I don't know if I'm just paying more attention or if Revlon is putting out more displays lately, but there sure do seem to be a lot of them. I've got pictures of a few to share today. I first spotted the Fire & Ice collection at the end of October. It seems to be a 48th anniversary throwback concept, at least that's what I got from the juxtaposition on the display of Jessica Biel in 2010 with Dorian Leigh in 1952. (Confession: I had to look up Dorian Leigh's name. Also: I find the 1952 photo more appealing.) Why not wait until 2012 and do a 50th anniversary collection? Or maybe they'll do that, too. The colors didn't grab me: All Fired Up (red creme), Siren (orange creme), Temptress (pink shimmer), and Demure (coral shimmer). I get it, they're classics, but I've already got versions of all of these colors that I'm happy with. I do like the retro script on the bottle handles, though. Some stores have a freestanding floor display for Fire & Ice, with the same nail polish colors plus some other makeup items. And then, just to screw with me, some stores have a different tabletop display than the first one. 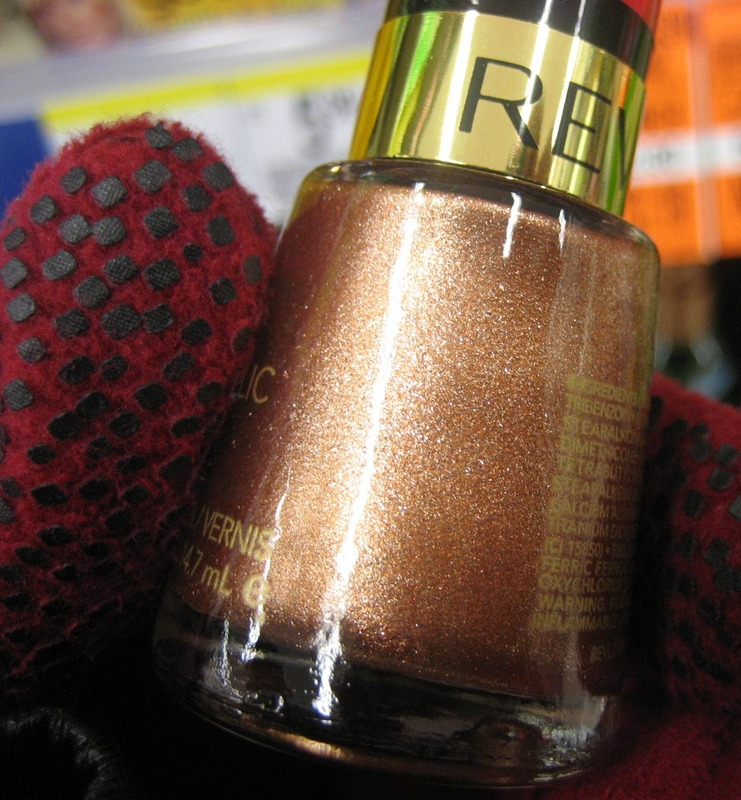 This variation adds Vixen to the four nail polishes in the other displays. Vixen is a core color, so what it's doing in a Limited Edition display, I have no idea. Perhaps someone at Revlon said "we've got to have a purple; I don't care what we were selling in 1952, in 2010 we need purple". That's what I'd say if I worked there. 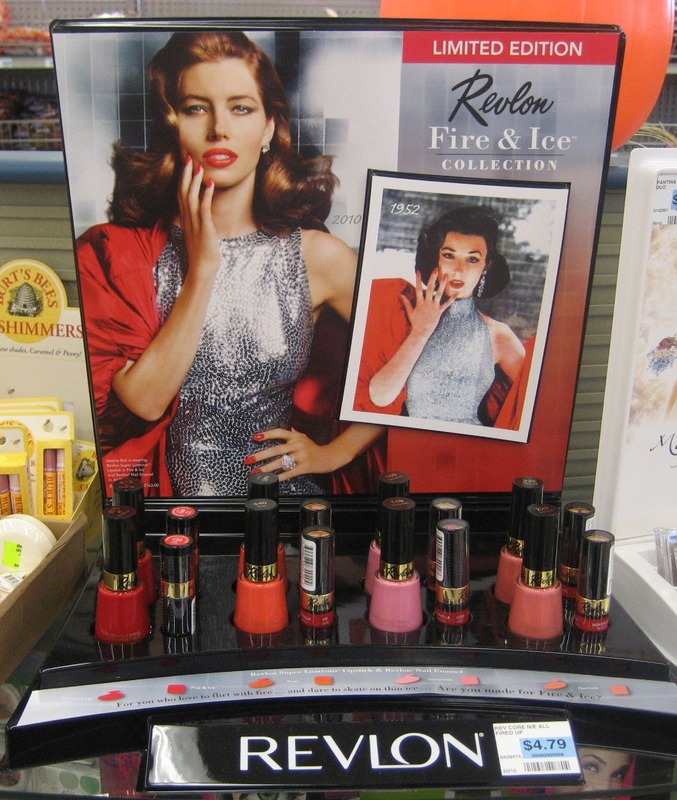 A couple weeks after the Fire & Ice displays started showing up at drugstores, Revlon Top Speed appeared. At least some of these colors were available in Canada this past summer, so when I saw them I thought "oh, I remember those from the nail board". There are several types of displays for these as well: tabletop, free standing, and corner end cap. You may have already spotted an annoying aspect of these: not all the displays have the same colors. The tabletop has 16 (Ocean, Jaded, Stormy, Grape, Orchid, Jelly, Sheer Cotton, Black Star, Bubble, Chili, Golden, Espresso, Cloud, Pink Lingerie, Fire, Sugar Plum). The free standing unit has 24 (Sheer Pearl, Sheer Cotton, Pink Lingerie, Candy, Electric, Jaded, Ocean, Cloud, Royal, Violet, Lily, Vintage, Peachy, Poppy, Fire, Espresso, Golden, Emerald, Bubble, Orchid, Lava, Sugar Plum, Stormy, and Black Star). The corner end cap has 32, including some shades that are in neither of the other two (Metallic, Cherry, Guava, Jelly, and Cupid). Also annoying: the way stores print their sale tags to make one think it's a better deal than it is. That yellow tag on the corner endcap that says 50% OFF in big letters also says "Buy One Get One" right above that, so the disount is really 25% in total. Still a sale, true, but not so fabulous as half off. This example is from Walgreens, but other stores do it, too. Meijer usually puts "BUY ONE GET ONE" in big letters and 50% off in tiny ones below it. Bah. 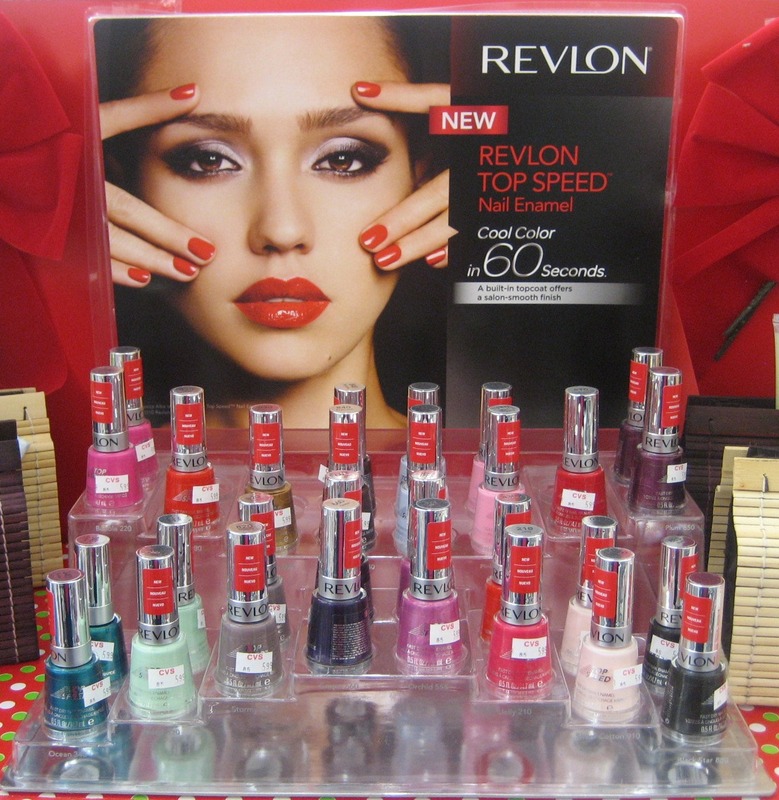 The Fire & Ice and Top Speed displays are nowhere near close to being sold out of polish in most stores, but that has not stopped Revlon. Yesterday I spotted a new display of scented polishes. Walgreens had quite unhelpfully put it on the very top shelf above shaving supplies near the back of the store. I'm 5' 7" (170 cm) and had to reach up over my head for the bottles. 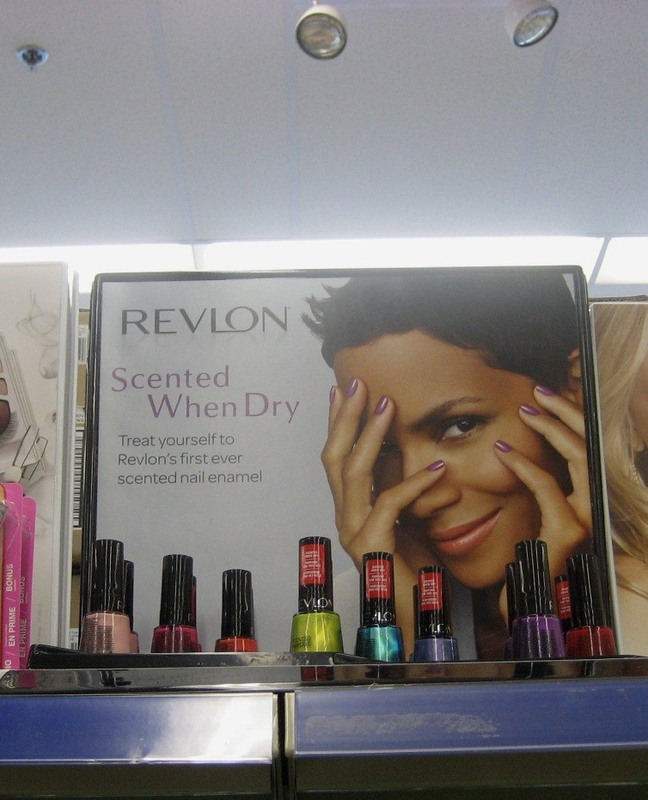 The display says "treat yourself to Revlon's first ever scented nail enamel", which seems odd since they've put out scented shades at least the last two summers and these bottles are newer than that. The bottles are new but the colors don't seem to be: Grape Icy (purple shimmer), Cotton Candy (light pink shimmer), Ocean Breeze (teal shimmer), Beach (acid green shimmer), and Bubble Gum (hot pink creme) were part of the Scents of Summer release this year; Not So Blueberry (periwinkle shimmer), Mon Cherry (red creme), and Mad About Mango (orange creme) were in 2009's Fruitful Temptations. I stopped at a different Walgreens on the way home from work to see if perhaps they had the scented display in a better place for me to get a good photo. They did not; evidently some directive came down from Walgreens corporate to put these out of reach. 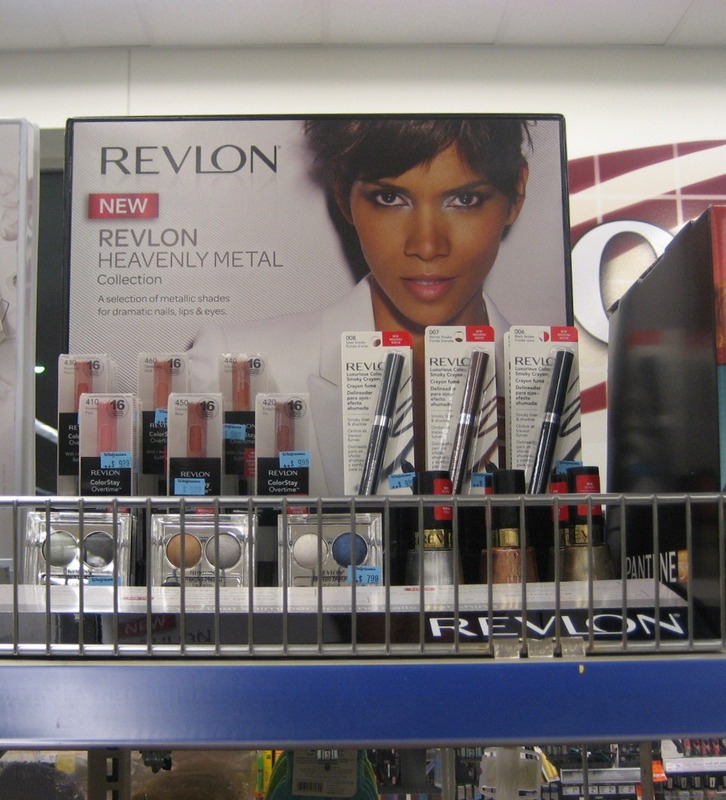 The second store did have something I hadn't seen yet: another new Revlon display called Heavenly Metals. It, too, was on a very high shelf and also behind a little wire fence to make it even more difficult to get at. By standing on my tip toes and reaching way up, I managed to get down one of each color of polish to look at. There are three: Silver Dollar, Gold Coin, and Copper Penny (I think you can guess what colors these are), all look like foils/metallics. The copper looked the most interesting to me so I took a close up of that one (still wearing my grippy fleece gloves; it's been so cold my hands take a while to warm up once I'm inside). With all this new stuff now, I wonder if we'll get anything fun in the doldrums of January or if I'll still be looking at these in stores when I really, really need a pick me up in the depth of winter. I really love a lot of the colors. I never seen the scented ones before! I should check out a walgreens when I have the time! Wow, they have a lot of displays. I haven't seen the scented ones. At my Walgreens they have a holiday display (with the suede green, red and white.) and the Top Speed display. The Fire and Ice collection is up on the top shelf in the shampoo section. No Heavenly Metals. 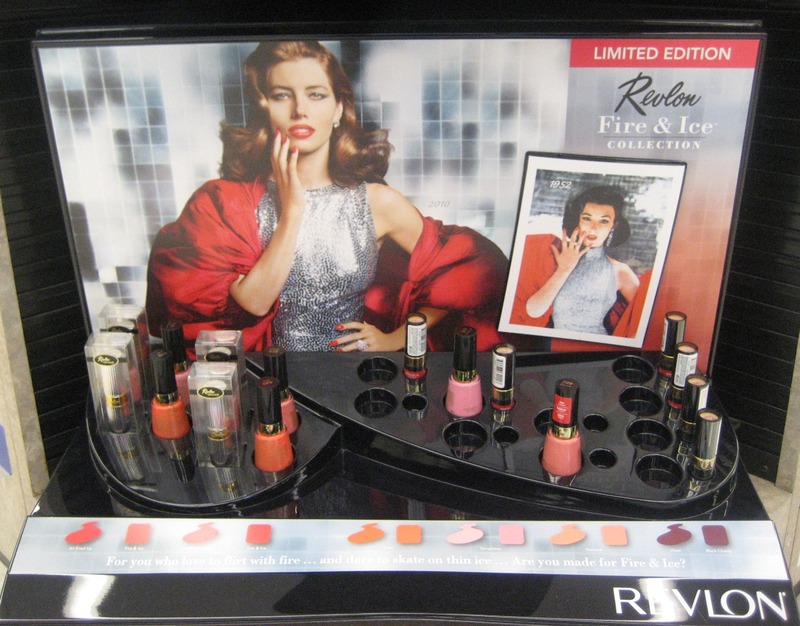 Have you seen Revlon Perplex? I can't find it anywhere.. I'm kind of frustrated with them, because I feel like none of these colors are unique...they're all so lame. But I would like the mango one...I love me some mango. Thanks for sharing :O) Great post. BTW, Loving that you're rocking Mittens at the end! Oooo, Copper Penny is so pretty!!! The SA at my Walgreen's pointed out this display while I was looking for Perplex, but I was so focused on finding it I didn't pay attention. I'll have to check it out soon. I buy nearly all my stuff online. Very rare that I go into a shop. I hate the displays. Distracting and shoddy. I like my polishes wrapped and delivered to my house! Fire and Ice is pathetic. Boring colours and you are right. The original ad was way better. Wow such a huge selection of colours! And so many interesting shades. Too bad we only get the basic boring colours here. My first thought was Jessica Biel looks silly compared to the beauty of Dorian Leigh. I agree the colours seem boring IMO. However, the Jessica Alba + Halle colours look a whole lot more interesting!! 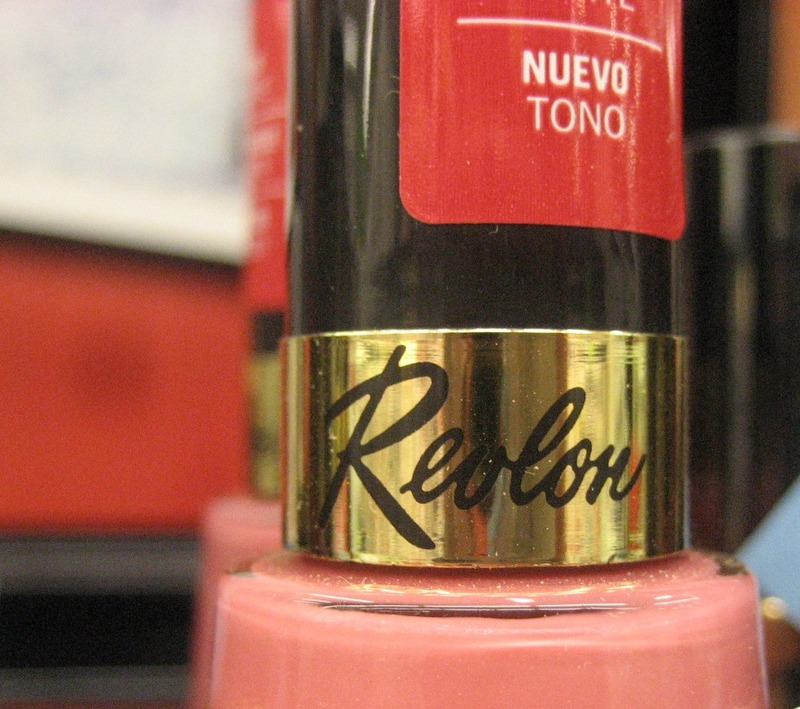 I just love Revlon's polishes. These new 60 seconds colors are beautiful. In my country there are only but a few different colors to buy, and all of them from the core line, nothing new. Even the Matte ones reach us. So sad!